Use the FlowCentric Collaborate BPMN software to turn your business processes into tangible assets. FlowCentric Collaborate is a cloud application for modelling business workflows. The software is easy to use and promotes team collaboration, which means that you can get all the right people to work together on perfecting your process diagrams. 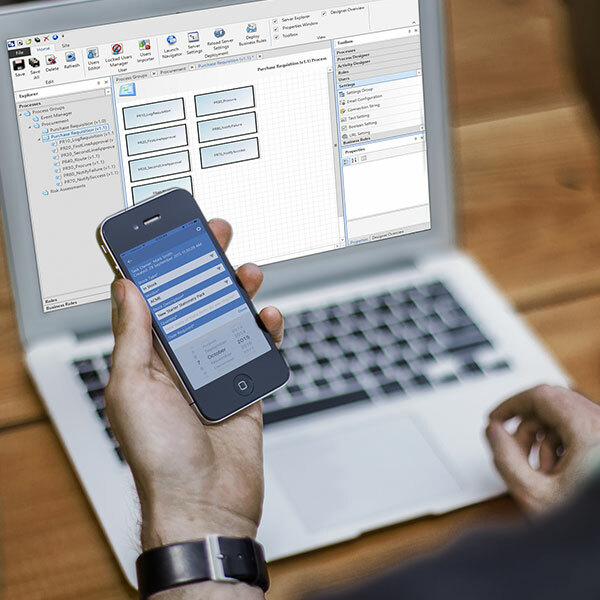 FlowCentric Collaborate not only allows you to visually model your business processes, but also allows you to create all the form fields that are necessary to digitise and automate your business processes with the FlowCentric BPM software. New to BPMN? Download our free reference guide and start today! Identify how your company delivers value to its customers and where to improve. Better visualise how different departments run themselves. Shape and reshape your organisation to remain competitive. See the impact of any change across multiple participants. Communicate changes more effectively to internal and external stakeholders. Encourage a culture of innovation by enabling your team to contribute to diagrams. Collaborate remotely with people, across time zones and countries. Versioning and approvals allow multiple people to safely work on the same project. Understand, capture and roll out best practices across your organisation. FlowCentric Collaborate gives you the power to test different business scenarios in a safe environment. Apply time, cost, and resource metrics to each step, for better insight into the total cost of a process. Easily compare your ‘as is’ model with the proposed ‘to be’ model. Find the best fit before implementing changes company-wide. Publish high quality documentation to your preferred format. Create your own document templates for corporate consistency. Publish policy, procedure, and training materials for distribution. Would you like a demonstration of the BPMN software? Add field data to each activity form. Export the mapped digital process to FlowCentric Processware. Add the process logic and user intelligence to the processes. Deploy the secure web-enabled form-based applications to end users.